Above graphic: Autonomous vehicles impact every business model. 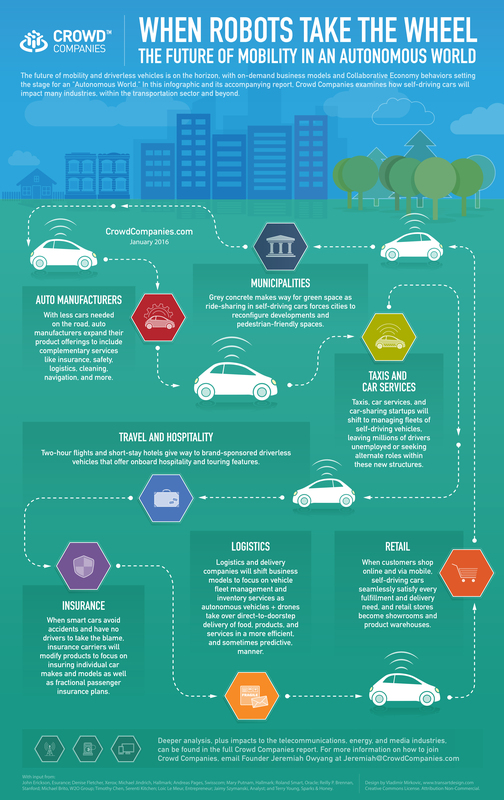 This infographic illustrates some the many industries that will be impacted, from Insurance, Logistics, Retail, Auto, and Cities. Though your company may still be adapting to social media technologies or Collaborative Economy disruptions, even more business model changes are coming. New autonomous technologies on the horizon are triggering greater acceleration of innovation programs to keep up. Google, Uber, Apple, Lyft, Tesla, BMW, Ford, Volvo, Yamaha, Mercedes, and other car manufacturers are working on producing self-driving cars, and the industry impacts will reverberate. Autonomous World: A future state when intelligent technology systems, operating without human participation, enable new business models in a more efficient society. These intelligent technology systems can take the form of many hardware and software products, including self-driving vehicles, drones, and other artificial intelligence. The Autonomous World is our futuristic vision, with society experiencing an inevitable “semi-autonomous world” with minimal human interaction before fully autonomous systems are operable and dependable. That’s right, the human drivers of taxis or Ubers will be cut out by robots who can do it better. Uber’s CEO elaborates further in BusinessInsider as to why they’re developing self-driving cars. Alphabet (formerly Google) is leading the way in self-driving car testing, and today it was even announced that autonomous cars could be considered“drivers.” Meanwhile, GM is close behind with its recent $500 million investmentin the development of an autonomous fleet utilizing Lyft’s platform exclusively. Silicon Valley tech companies like Uber, Google, Tesla, and Apple are heavily investing in these autonomous cars, leading with a technology approach rather than with a traditional Motor City approach. Meanwhile, Detroit and other car manufacturers are opening up labs and innovation centers in Silicon Valley as they, too, strive to integrate tech. What role do humans play when robots do it better? What are the business strategies required to compete in the autonomous world? At Crowd Companies, an innovation council, we recently hosted an event in Silicon Valley for our corporate members where we toured Stanford’s mobility lab, to see these vehicles first hand. Then, we held a panel of experts and council members responded to the impacts that are looming on the horizon from this next set of technologies. Brace yourself …more changes are coming soon.